The VIGO Northern Lights glass vessel sink and matching waterfall faucet set is sure to bring celestial hues to your home. 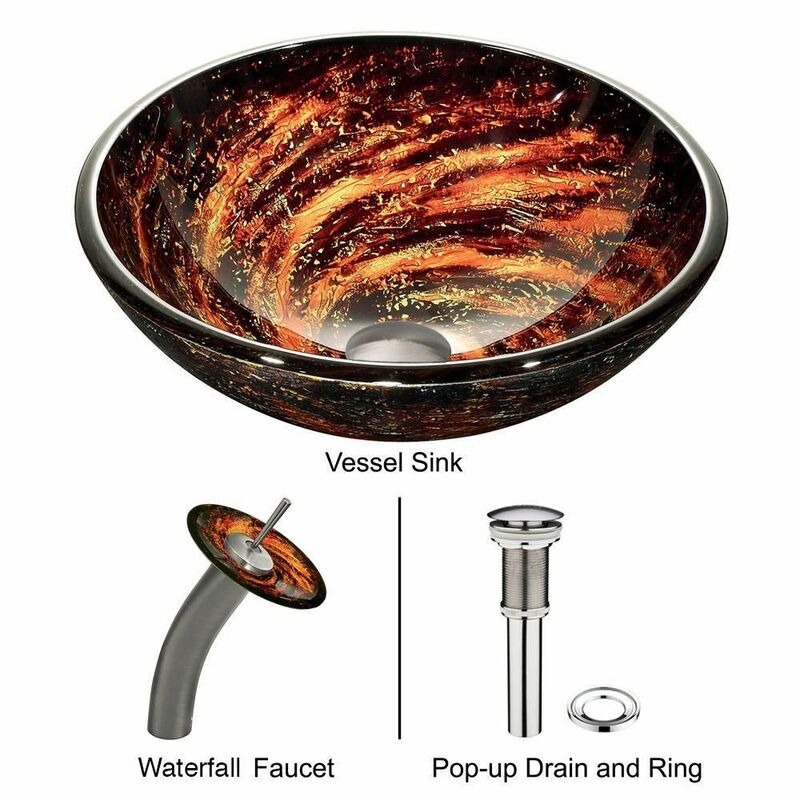 The VG07037 glass vessel bowl features a reddish-orange swirl pattern over a dark black-brown colour; resembling a view into outer space. Handmade with possible unique and slight colour variations, so no two sinks are identical. Glass Vessel Sink in Northern Lights with Waterfall Faucet in Brushed Nickel The VIGO Northern Lights glass vessel sink and matching waterfall faucet set is sure to bring celestial hues to your home. The VG07037 glass vessel bowl features a reddish-orange swirl pattern over a dark black-brown colour; resembling a view into outer space. Handmade with possible unique and slight colour variations, so no two sinks are identical. Glass Vessel Sink in Northern Lights with Waterfall Faucet in Brushed Nickel is rated 4.8 out of 5 by 11. Rated 4 out of 5 by TryToBeFair from Very Colorful The quality is good, and installation was seamless, following directions. The colors are a little brighter than I expected/wanted, but it has grown on me. We like glass (do stained glass and fused glass artwork), and it is very pretty. The granite top we chose to install in on is a little too busy. I'd recommend a top with little pattern/color variations, almost solid etc. I may be too hard on myself, everyone that has seen it loves it! It does spot with water, but I just have a cleaning/rag towel under the sink that I use to wipe it down, but not after every use. We have it in our master bathroom. Rated 5 out of 5 by Oceana from Beautiful !!... Beautiful !! Rated 5 out of 5 by Roses from Great I was very impressed with the packaging and how carefully and professional it was wrapped in its own soft bags I love the beauty of this sink It is a work of art!! I would love to show it to you. Rated 5 out of 5 by Audi from The quality of this product is impressive. VIGO knows how to package their products. This is a ... The quality of this product is impressive. VIGO knows how to package their products. This is a beautiful sink. I had to return it, because there was more black in it than I wanted. The sink must weight 30 lbs. Fast shipping from Home Depot. It's nice that they carry these products. Rated 5 out of 5 by TOMF from BEAUTIFUL DESIGN LOOKS GREAT. WHOLE FAMILY LOVES IT, AND WAS EASY TO INSTALL. GREAT DOCUMENTATION. Rated 5 out of 5 by Rbar from Just lovely Installed with matching vessel sinks. Very elegant and luxurious. A lovely addition to our master bath.